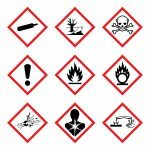 Manufacturers, Importers and Transporters of Workplace and Consumer chemical products are required to evaluate the hazards of the products they produce and prepare labels that communicate the hazard information to customers, users, first responders and inspectors. A corrosive substance is defined under various regulations including the DOT Hazardous Materials Regulations, OSHA HCS 2012, Federal Hazardous Substances Act, TDG Regulations, Hazardous Products Regulations for compliance with WHMIS (HPR), Consumer Chemicals & Containers Regulations (CCCR) and GHS as material that causes irreversible damage to the skin, namely, visible necrosis through the epidermis and into the dermis. What do the regulations require of manufacturers? Which test methods do the regulations cite for testing skin corrosion? OSHA advises that “In vitro alternatives that have been scientifically validated shall be used to make classification decisions” and “Examples of scientifically validated test methods for skin corrosion include OECD TG…..), and 435 (Membrane Barrier Test Method). Is Corrositex® a validated OECD in vitro method? Yes. Corrositex® was validated and published in 2015 as OECD 435 In Vitro membrane Barrier test for Skin Corrosion.